The peacock feather has been at the heart of Boucheron’s creations and archives since almost 160 years. Inspired by the ethereal grace of the “peacock feather”, Frédéric Boucheron created the famous “Point d’Interrogation” necklace in 1883 – the first of a long line. Since then, the Maison’s high jewelry collections have regularly featured new takes on this stunning feather imagined by the design studio headed up by Claire Choisne. Plume de Paon Necklace Necklace set with white topaz beads and paved with diamonds, in white gold. Plume de Paon Necklace Necklace set with lapis lazuli beads and paved with diamonds, in white gold. Slipped around the neck, the diamond and lapis-lazuli peacock’s feather gives the wearer an unprecedented seductive power. Frédéric Boucheron and his foreman were toying with a peacock feather when they got the inspiration for the Point d'Interrogation necklace: free, supple, light, aerial, celestial. WHITE GOLD 750 : 82.00 g"
The Maison Boucheron has always been known for for its daring and creativity. 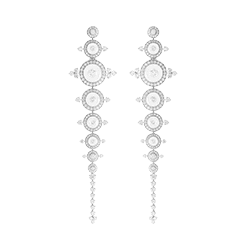 The Plume de Paon earrings in white gold set with diamonds attest to this desire to shake up established codes and to surprise by the originality of what is worn. The beauty and delicacy of the peacock’s feather (plume de paon) motif is captivating. It has been explored by the Workshop for almost 130 years. Worked with the greatest precision, the peacock’s feather seems to come to life as the wearer moves. A free-spirited creator, Frédéric Boucheron knew how to suffuse every piece in his collections with a touch of lightness. Almost a century later, the designs coming out of the workshops still carry in them the expression of freedom. The enamelling technique developed by Boucheron gives life to a strong and ethereal peacock’s feather. A pure beauty of nature, the peacock’s feather is an inexhaustible source of inspiration for Maison Boucheron. Its lightness is unmatched and it moulds to the shape of the body so that it becomes one with the wearer. The feather-light design of the Plume de Paon ring is stunning. 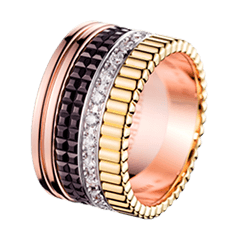 In the pink gold and diamonds version it sits sensuously over two fingers. Feathers have been a key motif in the Boucheron story since 1866. The masterful use of gold, coupled with an in-depth knowledge of how to create three-dimensional pieces, lend this rose gold necklace a floating structure and fluidity that exude strength and seduction. The figurative dimension of nature has always been an endless source of inspiration for the Maison. Its aesthetic ideal and wealth of symbolism lend this free, wild creation a breathtaking realism. 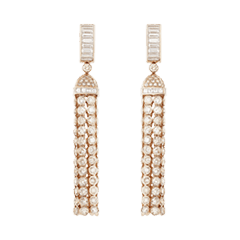 These drop earrings embody the Boucheron vision of nature as Nature Triomphante. Feathers are at the heart of Boucheron’s history and heritage. Inspired by nature, Frédéric Boucheron innovated, over 130 years ago, with feather creations strong in symbolism and style. Today, the Boucheron Maison revisits the feather by revealing a fresh approach to femininity. The Peacock feather collection (Plume de Paon in French) is born of Boucheron’s savoir-faire, this gives rise to exceptional creations, more vibrantly stunning and airy than ever. It was while “playing” with a peacock feather that Frédéric Boucheron and the head of the workshop imagined the Peacock feather necklace (Plume de Paon) : a jewel combining freedom, suppleness, lightness and unique creativity. Today, the Boucheron Maison revisits the feather, symbol of life, by revealing a modern approach to femininity. The Plume de Paon necklace is born of Boucheron’s savoir-faire, enriched by a new technique exclusive to the Maison: the specific assembly of diamonds which replicates the suppleness of a real peacock feather. The Hands of Light give life to the feathers.Thus, the creation moves with its wearer, like a feather ruffling in the gentle breeze. Feathers are at the heart of Boucheron’s history and heritage. Inspired by nature, Frédéric Boucheron innovated, over 130 years ago, with feather creations strong in symbolism and style. The Plume de Paon pendant earrings are born of Boucheron’s savoir-faire, enriched by a new technique exclusive to the Maison: the specific assembly of diamonds which replicates the suppleness of a real peacock feather. The Hands of Lights give life to the feathers.Thus, the creation moves with its wearer, like a feather ruffling in the gentle breeze. In its floral and plant designs, Maison Boucheron favors chance over fate, asymmetry over geometric formalism and organicity over order. Beneath the arcades of the Palais Royal where he opened his first boutique in 1858, Frédéric Boucheron could observe the wild ivy that had then conquered the city. Ivy has featured in the Maison’s collections ever since and has been reinvented with every new creation. The five new creations depict ivy, bejeweled and bold, twining around the wrist and neck, running between two fingers and adorning the ear. The Maison's personal vision of Nature - Triumphant Nature - has always fuelled the history of its jewelry. 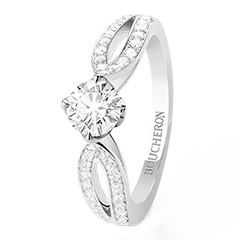 This year Boucheron presents the Lierre de Paris line in white gold and diamonds. 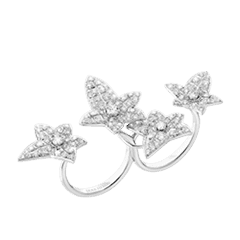 These light and dainty earrings reflect untamed Nature with their two diamond-set leaves of ivy that adorn the ear. Nature has been an endless source of inspiration for the Maison Boucheron since it was founded in 1858. Over the years, Nature's diversity, aesthetic perfection and rich symbolism have engendered creations as diverse as they are outstanding. 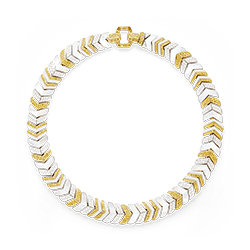 This year Boucheron presents the proud and wild Lierre de Paris line, which includes a pendant. The setting on white gold serves to highlight the veins of the leaves, as well as the characteristic lightness of the plant world. 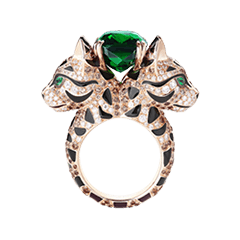 For Boucheron, Nature is free, proud and wild. And when perceived in its truth, its beauty is magnified. This year the Maison presents a Lierre de Paris line in white gold and diamonds. This new ring embodies the indomitable nature of ivy; its leaves subtly settle on the finger, creating a look that is as elegant as it is wild. En matière florale et végétale, la Maison Boucheron préfère la part de hasard au destin, l’asymétrie au formalisme géométrique, la naturalité à l’ordonnancement. Boucheron imagine cette année une ligne Lierre de Paris en or blanc et diamants déclinée sous la forme d'une double bague, joaillière et audacieuse. Cette nouvelle création symbolise la vivacité des feuilles de lierre qui s’enroulent entre deux doigts, à l'image d'une nature sauvage et indomptée. Lierre de Paris Bracelet Bracelet set with black spinels and paved with diamonds, in white gold. 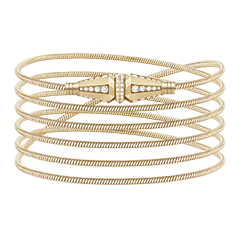 This bracelet is classic and modern, and emanates a special, enchanting light. The iconic ivy triumphs over the rows of black spinels and adorns the wrist with jeweled Nature. Lierre de Paris Necklace Necklace set with black spinels and paved with diamonds, in white gold. 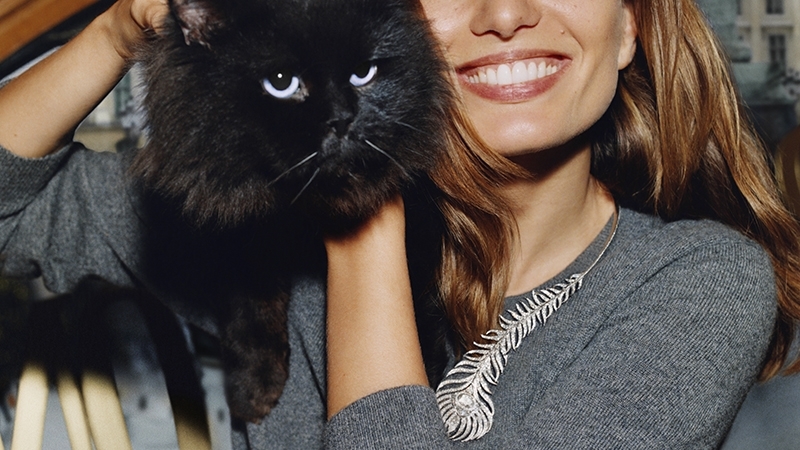 The black spinels and diamond-paved ivy leaves hang together beautifully in this necklace. With surprisingly flexible articulation, the many rows cascade around the neck. Lierre de Paris pendant Earrings Pendant earrings set with black spinels and paved with diamonds, in white gold. For Boucheron the night reveals some of the enigma of Nature. Wild, majestic and strong, it always triumphs over Humankind, as testified by these earrings with their cascading spinels and diamond-paved ivy leaves. La nature inspire depuis toujours l'histoire de la Maison Boucheron, qui lui donne vie dans la collection Nature Triomphante. Sa ligne Lierre de Paris, reprend le motif lierre à la fois sauvage et délicat. Ce collier Point d'interrogation en or rose s'enroule délicatement autour de votre cou. La ligne Lierre de Paris, qui symbolise une nature libre, fière et sauvage, se décline cette année en parure d'oreilles. Légères et délicates, ces boucles d'oreilles en or rose viennent sublimer une allure définitivement moderne. La Maison imagine cette année la ligne Lierre de Paris en or rose. Inspirée de la nature libre et sauvage, cette nouvelle bague double doigt incarne le tempérament indomptable du lierre. Ses feuilles grimpent subtilement sur la main, pour un porté aussi élégant qu'inattendu. The Pensée de Diamants is part of the Maison Boucheron’s history, and bears multiple messages. Pansies are wild and untamed flowers; they symbolize the pursuit of freedom. They are the messengers of the heart, and the wardens of feelings. 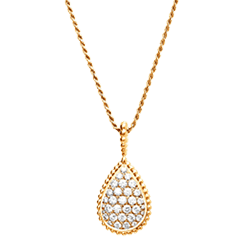 On a ring, a necklace or a brooch, of bright diamonds and pure gold, the Pensée will be a faithful reflection of your love. Pensée de Diamants large ring Ring set with pavé diamonds, in white gold. Iconic flower of the Maison Boucheron since 1875, the pansy symbolizes the attachment and the lovely memory that deliver a strong message: "I am thinking of You". The gold of the ring is meticulously sculpted and polished by the Hands of Light to enhance the brilliance of the diamonds and create a captivating play of light. The “Point d’Interrogation” (or question mark) necklace is a Boucheron classic. Designed with a “Pensée de Diamants” (diamond pansy), it has become even more iconic. In fact, the pansy has been an important flower for the brand since 1875. This full diamonds collection symbolizes attachment and fond memories. The Nymphéa brooch symbolizes femininity and finesse. Inspired by the beauty of water lilies, Nymphéa was designed with mother-of-pearl and diamonds, subtly enhanced with round sapphires and sapphire cabochons on white gold. The Nymphéa ring in mother-of-pearl, diamonds, and sapphires was inspired by the hypnotic beauty of water lilies. The play on volume of the petals and pistils embellishes the finger in the most feminine way. 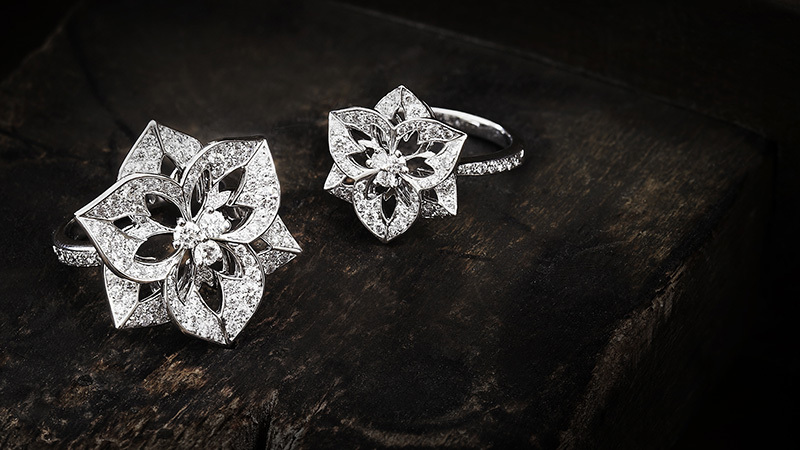 In the Flocon Collection the delicate, gossamer snowflake is given a graphic reinterpretation. Mother-of-pearl and diamonds are used together to give movement and realism to these creations of polar inspiration. Flocon Necklace Necklace set with a diamond and mother-of-pearl, paved with diamonds, in white gold. 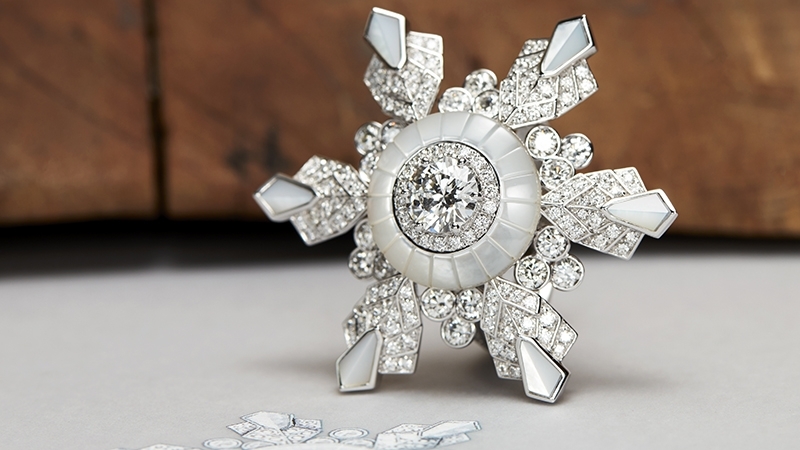 Boucheron evokes for us a snowy scene, white and bright. The Flocon pendant with its incredible structure has given Boucheron's Design Studio the opportunity to exploit the finest details, invisible to the naked eye, of this fragile and delicate work of Nature. Flocon Ring Ring set with a diamond and mother-of-pearl, paved with diamonds, in white gold. Flocon takes the intricacy and delicacy of the snowflake, enlarges it to High Jewelry scale and gives it great graphic strength. Set with mother-of-pearl and diamonds, the Flocon creation reflects majestic Nature reasserting itself over Humankind.